What Is The Definition Of Layback Spin In Figure Skating? 1. This upright spin involves the skater leaning back at the head and shoulders. The classic layback spin features one leg being lifted up behind the skater and the arms extended out and upward. 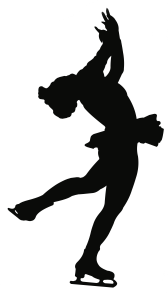 There are several variations on this spin, including the skater leaning toward the side rather than the back (sideways-leaning spin) or reaching back and grabbing the lifted skate (catch-foot layback spin). 1. Kerrigan changes it up, going from the layback spin to the more difficult catch-foot-layback spin.